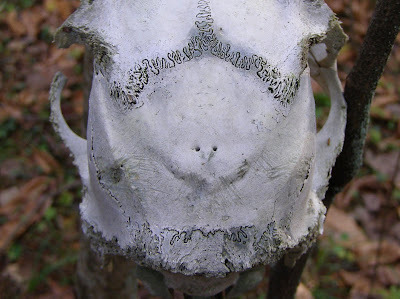 In keeping with the Holiday spirit, I’m offering some Halloween images compliments of the Blue Jay Barrens Nature Division. Unlike my normal posts, some of these images were taken more than seven days ago, but they were all taken in October and they are all from Blue Jay Barrens. A random test audience has concluded that these creations range from clever to dumb to you’ve got to have a twisted mind to see anything in that. 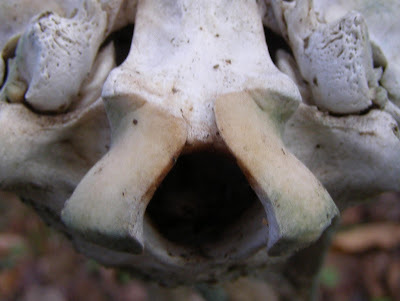 If you like, you can consider this a contest to see if you can guess what natural feature supplied the images. Sorry, there aren’t any prizes for being correct. Tomorrow I’ll show you the original image from which these were cropped. My daughter is currently a psychology major in school. She may enjoy the opportunity to analyze her father through these pictures. There is one plant in the dry prairies that refuses to stop blooming. 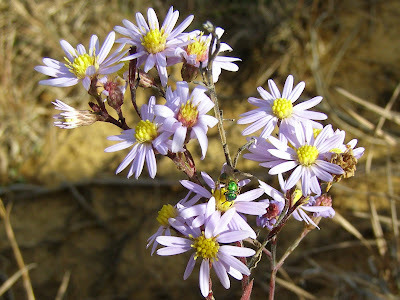 This is the Arrow-leaved Aster, a short plant that seems to wait until summer is over before beginning to bloom. This plant isn’t just holding on. Despite the fact that we’ve had many hard frosts, it’s continuing to produce fresh flowers. The lower leaves are dying. 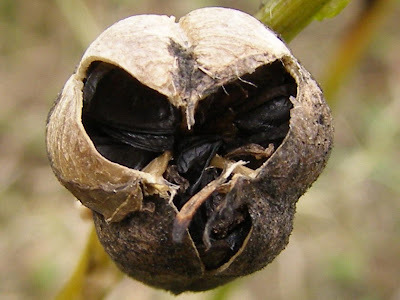 It seems a risky business to be putting so much energy into flower and seed production when the leaves are losing their ability to replenish that energy. The fact that this is a very common plant at Blue Jay Barrens, indicates that its survival strategy is sound. I love these mid-stem leaves. They are slightly thickened and sometimes feel like rough leather. This is one of those plants that has a lot of variation within the population. 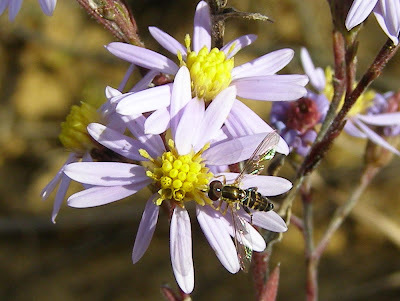 One day you may think you’ve found five different aster species in the field. The next day it’s just a field full of Arrow-leaved Aster. Variation is the key to new species development and this plant seems ready to take advantage of what ever the future may bring. These little green wasps were constant visitors to the flowers. They don’t have much of a choice of nectar sources right now. There were also a lot of these flies visiting the flowers. 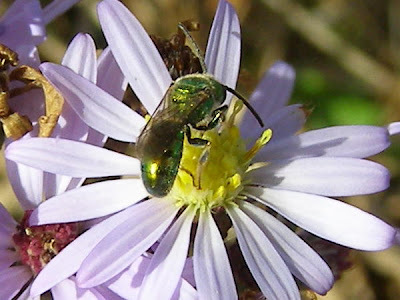 It’s fortunate that there are still active pollinators about. The weather has moderated some, so these flowers should be around for a while yet. The other prairie plants don’t seem to be offering much competition right now. Except for these random dots of lilac, the predominant prairie color is brown. Blue Jay Barrens doesn’t have enough water to make an island in the traditional sense. The islands I have here are ecosystems or patches of vegetation effectively isolated within the landscape. My oak island is a patch barely 40 feet across that contains an incredible diversity of oak species. The island is surrounded by prairie on one side and Eastern Red Cedars on the other. There’s even an eroded bank that acts as the shore of the island. One thing that makes this island particularly significant is the presence of the only specimen of Post Oak, Quercus stellata, that I have found at Blue Jay Barrens. Post Oak is one of Ohio’s uncommon species and it would really be nice to have more than the one tree. The Post Oak I do have isn’t even a prime specimen. The bulk of the tree is a horizontal branch that grows out over the eroded bank. The tree appears to be healthy, but horizontal growth like this is usually destined to failure. I’ve searched this tree every year for acorns and have yet to find the first one. Growing beside the Post Oak is a Blackjack Oak, Quercus marilandica, another uncommon species. There is a general similarity in leaf shape here. 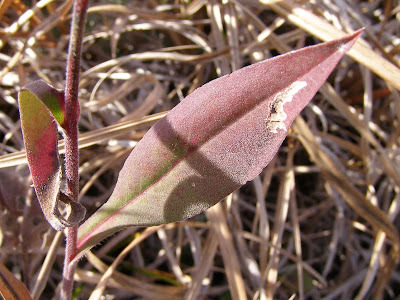 If you look closely, you’ll see that the main veins of the leaf end at a bristle tip extending from the leaf margin. This puts the Blackjack Oak in the red oak group instead of the white oak group with the Post Oak. 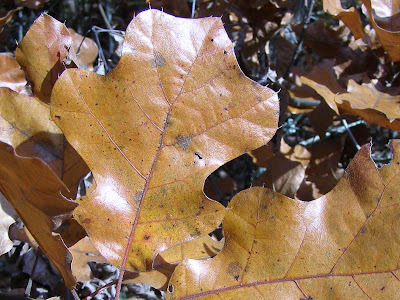 Oak leaves can be highly variable in shape, even when they occur on the same tree. 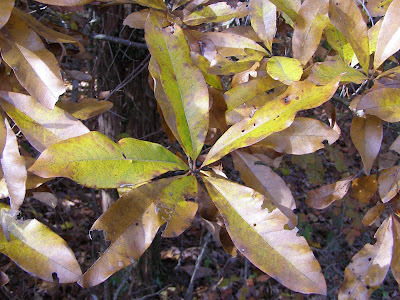 This leaf is not the typical shape for a Blackjack Oak and more resembles the leaf of Bush’s Oak, which is a hybrid between the Blackjack Oak and a Black Oak. Checking twig, bud and bark characteristics suggest to me that this is in fact a Blackjack Oak. Of course, I’m often high susceptible to the powers of suggestion. Especially when I’m the one making the suggestion. These oaks deserve a more detailed study. Several other oaks have inserted themselves into the mix. Here is White Oak, Quercus alba. Shingle Oak, Quercus imbricaria, is common at Blue Jay Barrens. Another common species is Chinquapin Oak, Quercus muehlenbergia. These oaks are growing in a tangled mess with some large cedars. I’d love to remove the cedars and allow the oaks to grow without competition, but cedar removal would create several problems. The oaks are growing through the cedar branches, so there is no way to remove the cedars without damaging the oaks. 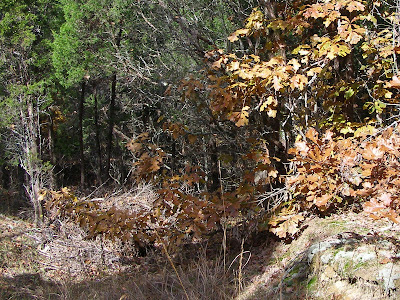 If the cedars could be safely removed, the oaks would probably not stand on their own. Oaks often become dependent on surrounding trees for support. When that support is removed, the oaks bow over and side branches begin to compete to be the new leader. The result is a misshapen tree with little chance of long term survival. The management decision here is to leave the island alone. Blue Jay Barrens has a broad range of grass species in its prairies. A variety of short grasses grow in this field, but it’s the Little Bluestem, Schizachyrium scoparium, that is most noticeable now. The fluffy spikelets catch the sun and make the prairie sparkle. Little Bluestem is the perfect grass for making waves and patterns on a windy day. 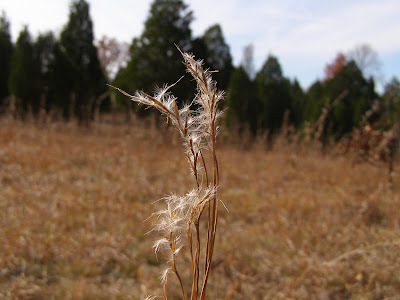 Little Bluestem holds its seed well and will stand up through most winters. When the sparrows have cleaned up the Indian Grass seed they will move into these fields and start going after the tiny bluestem seeds. Grasses, including Little Bluestem, are host plants to many species of skippers. During the summer, skippers are very plentiful in fields like this. Having multiple grass species in the field increases the diversity of animals that feed on those grasses. Many people confuse Little Bluestem with Common Broom-sedge, Andropogon virginicus, shown above on the right. 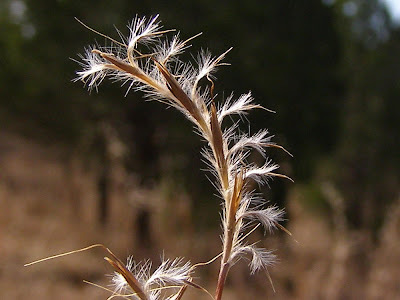 Broom-sedge is a stouter grass that tends to hide the seed inside the curled leaf blade. 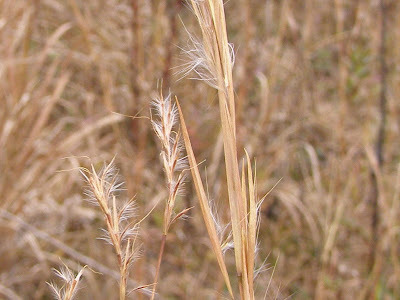 The Little Bluestem holds its seed out in the open at the end of a short stem. 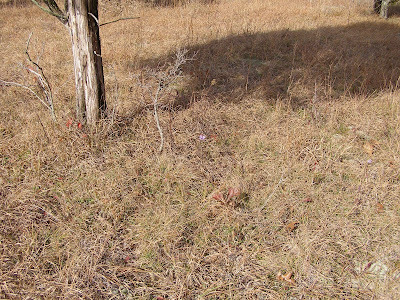 Both are native grasses and have a place in the prairie landscape. There are certain annual events that I look forward to each year. One of those is the emergence of the Buck Moth, Hemileuca maia, one of Ohio’s uncommon species. The Buck Moth is a member of the giant silkworm family, but unlike most others of that family, it is a day flier and is most commonly encountered in the middle of a warm, sunny late October day. 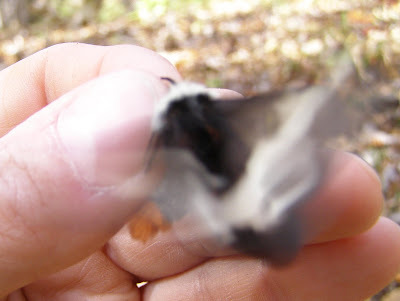 This is a fast moving moth that resembles a very hefty black and white butterfly in flight. The bushy antenna shows this to be a male. 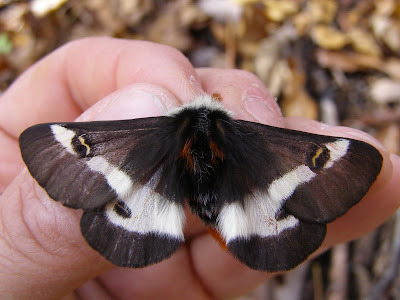 In fact, every Buck Moth I intercepted was a male on the search for a female. These moths are constantly moving and the only way to get a picture is to hold them. They don’t seem to have much awareness of their surroundings and occasionally run head-long into a tree trunk or get tangled in the branches of a shrub. I suppose they are following a pheromone trail towards the female. I’ve only seen one female Buck Moth and that was also the only Buck Moth I’ve seen that was sitting still. I watched dozens of moths travel through the woods, but never saw one stop flying. If they are following pheromone trails, just where are the females waiting? 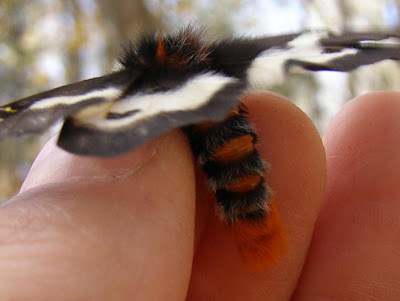 This is one hairy moth. It looks like this one is wearing one of those Halloween fright wigs. I suppose the hair must provide some protection against the cold, frosty nights this time of year. 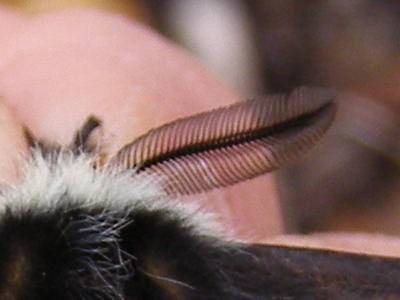 The tip of the abdomen is colored a bright orange-red. The abdomen was in motion the entire time I held the moth. Perhaps it sensed a female and was probing around in an effort to find her. 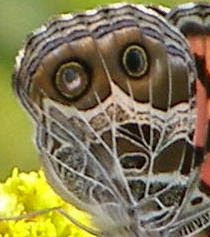 This is more the image you get when you see a Buck Moth coming through the trees. This moth’s activities were only briefly interrupted for a short photo shoot. It was released unharmed and continued its flight through the woods. 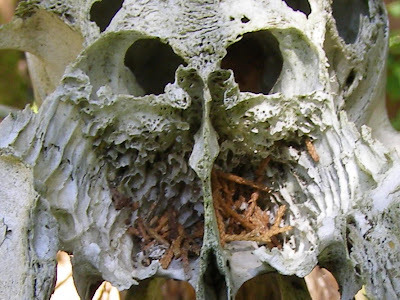 This is the type of area likely to produce Buck Moths. Oaks are the primary host tree. 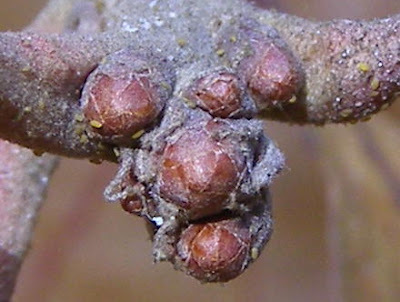 Females will lay clusters of eggs on the branches. The eggs hatch in the spring and larvae will pupate in the ground later in the summer. 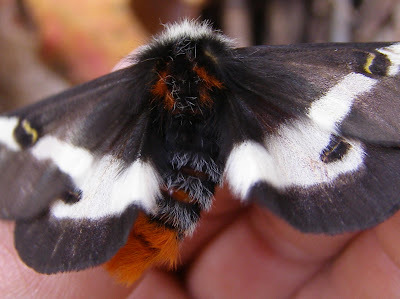 Buck Moths should be around for a couple more weeks, so watch for them when you are in the woods. I’ve been out checking some of the areas I want to work in this winter. One of those areas is a two acre pie shaped prairie that is lined by trees on the two long sides. I’ve done some clearing in most of the field and am working myself down toward the point. Out in the main part of the field, we have a nice stand of tall Indian Grass. As the field narrows, less sunlight reaches the plants and the tall grass begins to disappear. Here we find some honeysuckle and fescue mixing into the stand. Mowing this area will help reduce the honeysuckle and increase the numbers of native plants. Almost to the point and most of the grasses have disappeared. The yellow leaved ground cover is Agrimony and it really dominates here. Japanese Honeysuckle is increasing and Autumn Olive shrubs are coming in around the field border. I’ve spent the past two years clearing Multi-flora Rose from this area. At least now I can walk through it. 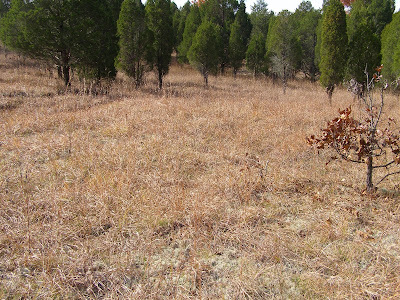 I’ll be able to mow this and mark the shrubs for spraying in the spring. I haven’t worked here at all yet. Rose canes are sprawling everywhere and are being woven into a mat by the honeysuckle vines. Blackberry canes stick up here and there to complete the arrangement. Working in a thorny thicket like this can be tricky. I’ve come out of these places looking like I’ve been wrestling with the cat. Those of you who’ve met our cat, know how bad that can be. I’ll definitely want to have several layers of clothes on when I tackle this mess, so I’ll have to wait for a really cold day in order to work here. Finally we move into a more typical woodland. I plan to maintain this end of the field as a transition between grassland and woodland, but I want it to be a transition composed of native plants. It may be a few years before that goal is finally achieved. I went around Saturday and checked some of the nest boxes scattered around the prairie. This box was built by the local FFA chapter about two years ago. Several families of Bluebirds and Tree Swallows have fledged from here. The 2009 nesting cycle for this box was Bluebirds-Tree Swallows-Tree Swallows and then this base that was never completed. I clean the old nest material out after each fledging to help cut down on parasites. The amount of dust accumulating beneath this material makes me think that birds have or are currently roosting in this box. I usually clean the boxes out in mid November and put a couple of inches of dry, soft grass in the box for the birds that will roost there through the winter. On those zero degree winter nights, it makes my feet feel warmer to think that the birds have a little bit of insulation beneath them. Looks like a male House Wren built one of his stick nests on top of a Chickadee nest. This box is close to the field edge and never contains Bluebirds or Tree Swallows. Some of the boxes become hidden in the tall Indian Grass. This box was constructed by the ODNR Division of Wildlife about sixteen years ago. About 400 of these boxes were given to landowners in Adams County as part of the Division’s Bluebird Program. I received 10 of the boxes and in return, provided several years worth of nesting records to the Program Coordinator. Here’s another nest base that was never finished. Bluebirds fledged from this box in the spring. After that, the Bluebirds and Tree Swallows competed for the box the rest of the nesting season. One week Bluebirds would seem to have possession and then the next week, Tree Swallows would be in control. Maybe that’s why there’s such a thick layer of grass in this box. Each time a new pair would take over, they would add a little bit more nest material to the ever growing pile. There were other available nest boxes near by, so I don’t know why the battle was so intense for this particular box. A wasp began a nest in this box. It never managed to produce a brood. 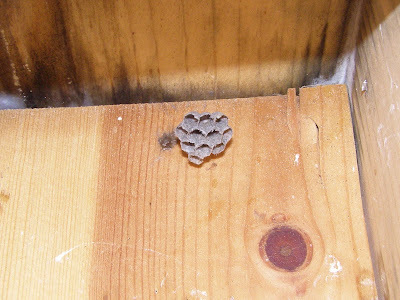 Usually, wasps don’t move into these boxes until the nesting birds have left. The changing leaves tend to make me spend more time looking up as I walk through the woods. The tree canopy is thick enough here that sunlight hasn’t shown through since spring. As the leaves fall, beams of sunlight begin to illuminate the tall tree trunks. This area of tall trees could be thought of as tall timber country, except for the fact that timber implies logs destined to become lumber and these trees will not be cut. 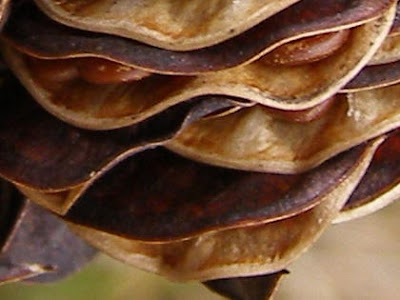 The tall Shagbark Hickories display their characteristic loose, peeling bark. Somehow, you don’t seem to notice this bark in the deep shadows of summer. I wonder if this is the type of tree an Indiana Bat would like to call home. The timing was all off for a colorful fall season this year. 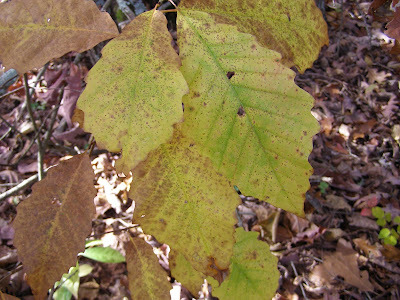 Walnut and Ash dropped most of their leaves before the Sugar Maples began to yellow. Clumps of bare stemmed trees gave the appearance of smoky, unfocused patches in the forest canopy. In this grouping, a single ash is still clinging to some of its leaves. I’m used to seeing defective trees in the woods. I’m sorry; I mean to refer to them as “trees with character”. I took this to be another multiple stump sprout. 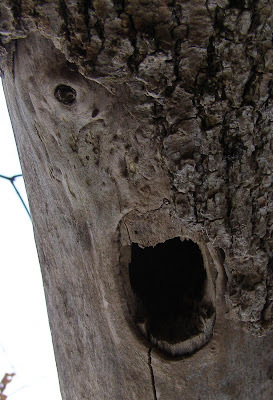 When I looked up, I found one trunk becoming an oak and the other becoming a Tulip Poplar. The poplar overtops the oak, but based on the growth rates for these species at Blue Jay Barrens, I’m guessing they are about the same age. A closer look at the base reveals two distinct individuals battling for dominance. It’ll be interesting to see how this fight progresses. It would really be interesting to see what’s happening at the interface between the two trees. 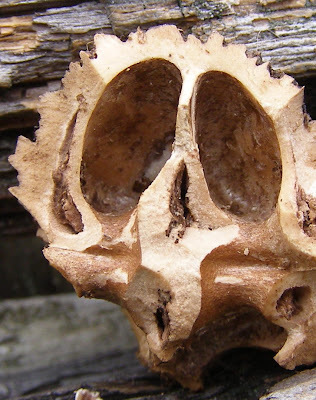 Could the poplar and oak possibly merge to become one Frankenstein organism? My adult self says it’s more likely that one will die and its decomposition will remove needed support, causing the other to fall. My kid self expects to be picking up pop-corns from beneath this tree in a few years.